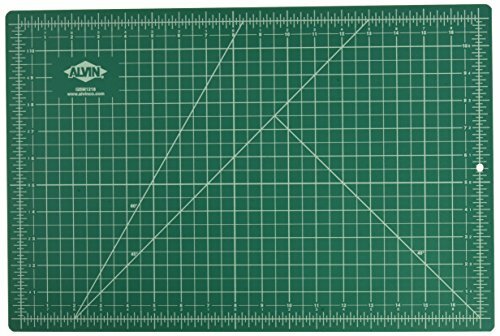 These self-healing and reversible cutting mats are 3mm thick and extra durable. Made from a unique composite vinyl material designed for both rotary blades and straight utility blades, they provide a long-lasting, non-glare surface that can be cut and slashed constantly without showing marks or cutting lines. Can also be used as a desk blotter or general-purpose work mat. Hanging hole for convenient storage. Find the perfect center on any project with zero centering lines. Cutting mat is green on one side, black on the other, both sides with grid lines. 12 inches x 18 inches .